Pam: It's been wonderful to read your blog, about traditions and cuisine I know nothing about. It's especially a pleasure to have someone blogging from the Canadian prairies. Pam, I find Ashkenazi food so exotic- and I never can wrap my mind around the idea that our Syrian food might be considered exotic by anyone-it's just plain food. For Passover this year we hosted a second seder for one of my daughter's friends- I made a typical Syrian seder but I added a gefilte fish course and instead of a minty soup I made a cumin spiced chicken soup. In deference to our guest I didn't serve any rice, or peas- which are usual accompaniments to a seder here. Chicken soup, made with thighs, garlic, carrots, celery and cumin. Avocado halves filled with Balsamic vinegar(Bartenura) accompanied by a salad of tomatoes, cucumber, mint, parsley and Bermuda onions. Braised lamb shanks(our traditional seder meat course) made with tomatoes, garlic, onions, celery, carrots, cumin and chicken broth. Zucchini and tomatoes, stewed with LOTS of onions. Olive oil roasted small white potatoes- these are put into a souffle dish, covered halfway with olive oil, then liberally salted and lightly sprinkled with whole cumin and cracked peppercorns, then roasted near the lamb shanks. Too delicious for words! For dessert I made small bowls of frozen fruits pureed with almond milk- blackberries, blueberries, strawberries and bananas- which I served with sticks of sugarcane and dark chocolate covered matzoh shards that I had dipped earlier. I normally make pistachio ka'ak and almond cookies, lachm la'lou(a sweet stew),chicken with prunes and keftes b'hamoud-lamb meatballs in a lemon mint broth, but there were only 2 young people to eat all of my cooking- and I was avoiding kitniyot-I had to limit myself! I noticed you use table salt in the pictures you've shared with us on the blog. Why not kosher salt? Thinking about what to cook tomorrow. How do we feel about blintzes? Love me some blintzes, but please make them potato. Since you asked so nicely, I made potato blintzes for you and cheese blintzes for me. Then I forced myself to have both for dinner. Why, thank you so much! And such a fine job you did, too. My blintzes are often as big as an Oldsmobile, and my bletlach or blettle (thanks for the new words!) are clearly way, way too thick, based on your photos of properly made blintzes. Are they at all crunchy when you serve them? Howard thinks they shouldn't be, and he's probably right, but I like some crunch. Interesting that you cook your matzoh balls for so long. I always thought the Streit's recipe made for mushy balls, but perhaps I just like them a bit more al dente than most. I made matzoh ball soup yesterday, using up some odd chicken parts from the freezer, including an old hen and some chicken feet, but my broth never turns out as yellow and clear as the beautiful stuff you made upthread. Pam... Are the matzoh balls floaters or sinkers? Good morning! I'm running a little behind this morning. Today we were supposed to open the store at 10 AM -- I got here at 9:30 and the store was packed and the phone ringing off the hook (my father opened the door when he got here). Lots to answer and post - I'll be back as soon as I can! PS: A couple of blintzes and some fresh fruit for breakfast. I also have a non-Passover related question. I've been looking for kitchen stools for months and can't find anything I like. Anybody have good ones? They need to be comfortable as they'll probably be the only seating in the kitchen. And I'd rather not have to sell my stove to pay for them. Why is it so hard to find good stools? Ooh. I've never been to that site. They actually have one that I like that isn't too pricey. . will have to investigate shipping to Canada. Thanks! And most of the design choices have been made, thankfully. I just have to pick the counter (will be going with quartz) and the backsplash (probably glass). Otherwise, the floor will be grey (polished cement) and the IKEA cabinets have been sitting in the garage since October , and all of my stainless steel appliances are waiting in my builder's house out in the country! Everything is white and stainless, so I want to try to bring some colour in with the stools and backsplash. Counters will be white -- better for picture taking (all of the pictures for my last cookbook were taken on my kitchen table. I use both, actually. I like David's kosher. When I'm baking or adding salt to dressings or batters, I prefer table salt -- it just dissolves better. I use the kosher salt when I seasoned the brisket, the roasted potatoes, etc. We also use it for what it's really meant for -- when we broil the livers for chopped liver, they get salted with kosher salt to pull out any excess blood. Because it doesn't dissolve completely it's supposed to rinse off better after the broiling. Do you use kosher salt only? all of my stainless steel appliances are waiting in my builder's house out in the country! Interestingly enough, I thought you lived "out in the country!" Yes, unless I'm using one of the myriad fancy salts I have clogging up my pantry. Thanks! Wish we had some local produce to show off. At least there's no snow on the ground here. My blintzes aren't really crunchy, though the potato would be considered crunchier than the cheese (even though the wrapper is the same for both, they really brown up differently). They're more . . silky? Mushy or light and fluffy? If they're too light, add some more matzo meal to the mix. Oh, chicken feet. I've never used them because we can't get them, but my grandmother always used chicken feet in her soup -- and my uncle always sat at the dinner table gnawing at it. All of our chicken comes from out-of-province and apparently they're not allowed to ship the feet across provincial borders. At least, that' what we've been told. Floaters, but not the lightest in the world. I prefer them in between. I want to be able to chew them, not have them completely dissolve. I had a cousin who made cannonballs when I was a kid. I don't want them too dense, but I don't want them heavy either. I find you can adjust the density by adjusting the amount of matzo meal in the mix. You're exactly right. You menu sounds exotic - and fabulous! I'd love to cook for Passover with you -- a bit from your menu, a bit from mine. Pam-are there any reliable online sources for schmaltz or is it pretty easy to render it at home? Not up here, David. We get all of our schmaltz from chicken soup. We make so much chicken soup that we can usually get a couple of litres of fat from a batch. My grandmother used to make it from chicken skin, and if you were lucky you got a piece of the gribenes (what remains from the skin and fat) as a treat. The chicken soup method is easier. Hey! Winnipeg is the 'big city' in these parts. I lean towards the sinker side. I like some chew in my matzoh ball. I am tempted to make some after passover with duck schmaltz from a few weeks ago. Have I mentioned how important eggs are during Passover? They're used a lot. 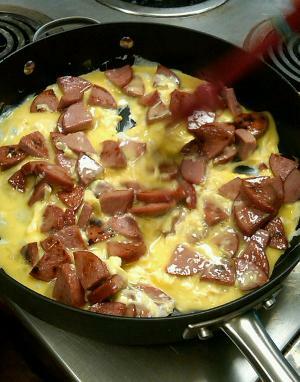 And for lunch we had eggs, with salami. 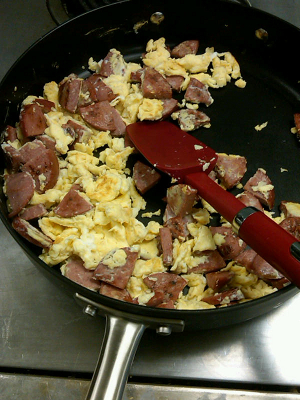 Once a year we make salami and eggs. Today was the day. 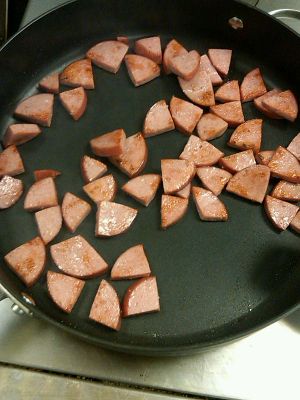 Slice the salami and cut into smaller chunks. Into a dry pan over med-high heat. When it's nice and brown, add some eggs -- no need to add anything else. The salami will flavour the eggs. Cook until done - no runny eggs in this dish. Lunch for 4. Ketchup is optional. And, once a year is enough. 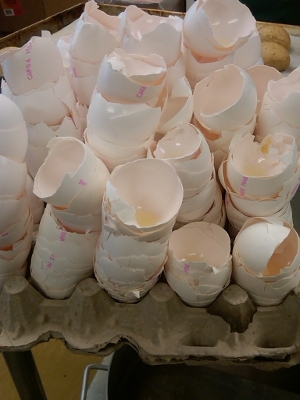 Next batch is scheduled for April, 2012. Oh, do it. And report back, please. I have to try it with onion. That could only add goodness to it. Occasionally I'll add fresh chives, parsley and dill, but I've never tried fried onions. Pam it looks like you are a non stick kind of girl. Do you have a favorite pan that is your go to everyday? It is so interesting because in my dialect bletter are leaves and yours are thin like leaves, and blettle would be little or smaller leaves. Quite descriptive of the dough. Alan, I for one hope you will share your recipes, especially the herring. I love it! Following this blog is such a delight. Thank you, Pam! Hmm. Interesting. The only thing I make that I insist on using non-stick for is the blintzes. Until your comment though, I didn't even think about discussing this Passover-related issue. If you keep a kosher kitchen, you have multiple sets of everything: dishes, cutlery (that's Canadian for silverware), knives, pots and pans. You have one set for meat and another for milk -- and at work we have, as some people might in their homes -- another set for parve (which means neutral and is neither for milk nor meat). For Passover, you have to have a whole other set of everything - in milk and meat and maybe parve (although some things can be 'kashered' or made usable for Passover). But because it's only for 1 week, I have very few pots and pans for Passover and I never really thought about it, but my Passover pans do seem to be non-stick. They are also inexpensive, bought at the grocery store pans. None of my pots are.